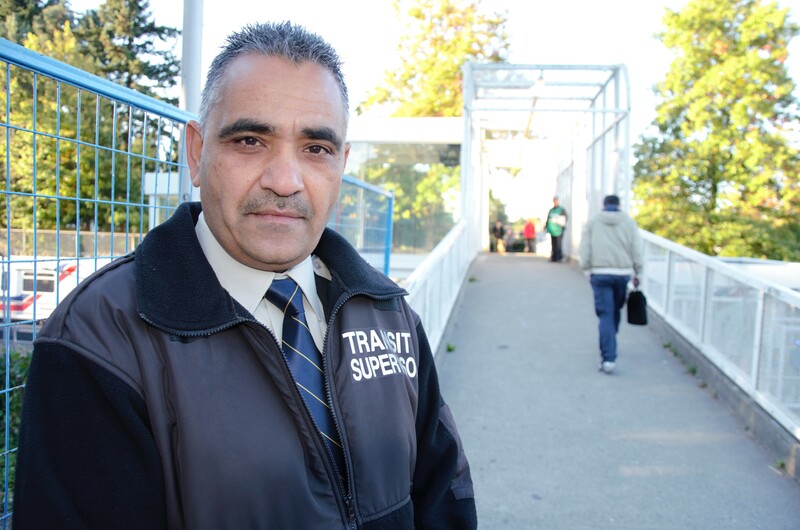 CUPE 4500 member Surinder Sahdra has responded to a variety of situations in his 18 years as a Transit Supervisor for Coast Mountain Bus Company. From problem passengers and vehicle breakdowns to reuniting lost children with their parents or finding lost wallets and cell phones—or even laptops—and returning them to their owners, he’s seen it all. But until October 18, he had never had to pull someone back from the brink of a suicide attempt. On that Thursday morning, rush hour traffic was at its peak when Sahdra responded to an incident near the Knight Street bridge where police had blocked off part of Marine Drive. He was helping police lead traffic through the road block when passing drivers coming from the opposite direction began honking at him and telling him there was someone on the bridge who looked like they might jump off. “I was fairly close and I was going in the same direction, so I thought I should check it out, just in case,” he told the Translink Buzzer. Driving over the bridge, he spotted a man near the Mitchell Island exit, straddling the railing. Sahdra immediately contacted TComm and then pulled up to where the man was standing, got out and began talking to him. “My instinct was, if I don’t grab him, he’s going to jump, and then I’ll regret it for the rest of my life,” he said, recalling his split-second decision to jump over the concrete barrier and grab the man’s arm to hold him down. While Sahdra kept TComm updated throughout the incident, another Transit Supervisor, Frank Liptak, ran over from the other side of the bridge to assist. Both supervisors were able to calm the man down while waiting for police to arrive. When asked about the incident by CUPE Communications, Sahdra says he did what he had to do in the moment. CUPE 4500 President Neil Pepper begs to differ. For example, Pepper cites the Ride to Survive, an annual 400-kilometre bicycle marathon from Kelowna to Vancouver that Sahdra has being doing for the past decade. He first got involved in the Canadian Cancer Society fundraiser when one of his colleagues was diagnosed. “Yes, as a matter of fact I’m training for it right now,” admits Sahdra.